Successful IT departments manage change by thoroughly understanding their requirements. Skipping over fundamental thinking and planning will negatively impact achieving your goal. Over my career, I have seen a lot of hyped technologies come and go. Some struck it big and had a huge impact on enterprises (e.g., server virtualization), and some were a swing and a miss (e.g., network access control). What I found, however, is that enterprises that were successful in adopting new technologies were headed by people or teams who spent time either formally or informally in considered thought about what was needed to make IT better. You have probably come across Maslow’s hierarchy of needs, which describes the order of requirements needed to attain a goal. In Maslow’s hierarchy, the goal is self-actualization or the ability to be creative, solve problems and be a member of society. It is an interesting metaphor for life and, not surprisingly, for IT. When I think about the practical application of IT paradigm shifts in general and specifically with SDN, a hierarchy of needs emerges. Enterprises have to understand the short comings they are facing in their technology and determine if they are significant enough to warrant solving. Do this first, so you do not have to waste time going further. Automation raises the specter of machines run amok and very public meltdowns that have happened over the years to large IT shops such as Amazon, Google, Microsoft and the 2010 flash crash caused by algorithmic trading. Mistakes loom large and overshadow the hours, days, weeks, months and years that go by without an automated incident. Automation can and does function when implemented correctly and is not as difficult as you might think. SDN – the entire software-defined movement – will change your IT culture from one of tightly controlled manual processes run by IT silos to a culture where more and more automation is needed to address the underlying complexity. This will require extensive collaboration across silos, including bringing developers into the fold. You will have to get everyone swimming in the same direction. That means changing job roles, how employees’ performance is assessed and even compensation plans. Changing your IT culture will require effective leadership. 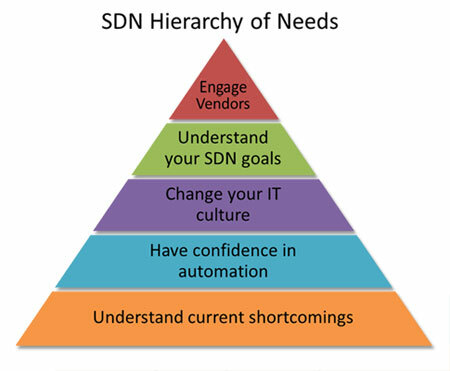 Once everyone is swimming the same way, you are ready to formulate and understand your SDN goals. The lofty aspirations of a fully automated, hands-free network (or data center) may overreach your requirements. Part of understanding your goals are setting requirements, mapping out dependencies and performing gap analyses which will guide your implementation. Finally, you are ready to engage vendors. If you have satisfied the preceding steps in the hierarchy, you are well prepared to find a good fit for your requirements. Look beyond your current vendor and the other products in the market. Each vendor’s SDN products, integrated product ecosystem and dependencies are fundamentally different and aligning your needs with their capabilities will be critical to your success. Previous postHow Much More Money Will be Lost Before Companies Begin Strategically Investing in Security? Next postWhere Are All the U.S. B2B MVNOs?